Strong partnerships with schools at which RESET offers hands-on STEM programs are instrumental to our ability to reach children with enriching science and math programs and field trips. 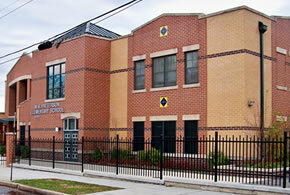 RESET has partnerships with Washington, DC area elementary schools, Pre-Kindergarten centers, and one middle school. These include schools in Washington, DC; Montgomery, Prince Georges and Anne Arundel counties in Maryland; and Alexandria, Arlington, Fairfax, and Prince William counties in Virginia. New RESET school partnerships are sometimes initiated when a new volunteer has a preference for working at a specific school, neighborhood, or jurisdiction. In that case, RESET reaches out to establish a connection with a school. Others result from a teacher who contacts RESET, expressing interest in having programs at her or his school. After obtaining a statement of support from the Principal, RESET seeks to find and place volunteers at those schools. Educators learn about RESET from their colleagues who have experienced programs in their schools and recommend them to others. Other principals and teachers discover RESET through our web and social media sites. RESET and each school enter into a Memorandum of Agreement that spells out the responsibilities of each partner. These include provisions relating to planning, scheduling and implementing RESET programs; coordination among volunteers, teachers and RESET staff; program costs; and teacher and student program assessment. The RESET Core School Partnership program was established to strengthen partnerships with a limited number of schools. The goal is to expose students to Science, Technology, Engineering and Math (STEM) professionals and hands-on learning experiences in multiple fields of science as they advance grade levels. This program enables RESET to increase the benefits to students by exposing them to more intensive STEM experiences and to a variety of professionals, their motivations for STEM careers, educational pathways and the kinds of work that they and their colleagues do on the job. With a sustained and robust STEM presence, RESET will compare the science standardized test results at Core Schools with other schools in the district. RESET establishes a high priority on recruiting volunteers for Core Schools, offering programs for students at multiple grade levels and placing RESET volunteers in optimal grade levels. There is an emphasis on working with teachers and volunteers to present programs that align with curriculum objectives and standards of learning. At Core Schools RESET reaches out to parents/guardians by providing letters describing their student’s RESET volunteer’s credentials and the topics that will be covered during the program. Volunteers are encouraged to provide students with a take-home experiment to demonstrate to their families. Where possible, RESET volunteers participate in Science Nights and cooperate with Parent and Teacher Associations. Each RESET Core School contributes to the partnership by designating a responsive contact who is readily available to RESET, and by placing volunteers at optimal grade levels with teachers who share our STEM objectives. The school hosts a meeting early each term for RESET with the Principal or designee to review the past semester and plan for the semester ahead, and convenes meetings for volunteer/ teacher teams to develop classroom plans and schedules. RESET also relies upon core school partners to facilitate interaction between RESET and parents/guardians, and to help assess RESET’s impact on student attitudes towards, and achievements in, science learning. RESET has Core School partnerships with three schools: John W. Ross Elementary in Northwest DC, Cora Kelly Elementary School in Alexandria, VA, and Barrett Elementary in Arlington, VA.